Home»News»Company News»What does < 1ppm NOx mean? What does < 1ppm NOx mean? The Ener-Core Power Oxidizer technology produces heat and power with less than 1ppm in its exhaust stream. It is the only technology available in the world today that can achieve this ultra-low level of NOx. But what does this actually mean? How big of a difference is this really? Where does the NOx come from? The move from traditional combustion based energy generation to wind and solar exerts a positive effect on the total emissions from the Energy Generation Sector, but this still remains a minority generation capacity and combustion of fuels will remain with us for some time to come. Traffic remains and will remain the largest single source of NOx pollution until the combustion engine is phased out and electric cars become the norm. 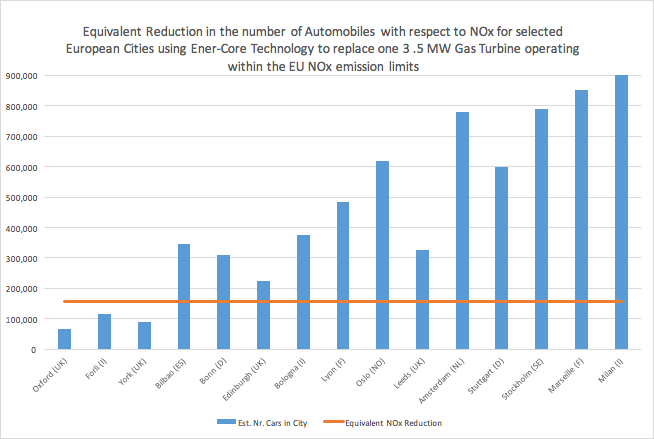 The recent scandal concerning emission level cheating by “certain” car manufacturers has highlighted this issue but the real challenge is the total volume of traffic on the roads and the fact that although the latest emission standards for automobiles might be improving the NOx situation, it is far from being eliminated. How are governments reacting to the NOx problem? Despite the high associated costs that these emissions cause, the move to tackle them is slow. In most parts of the world there are no limits on the actual amounts of NOx emitted, either by industry or by individual car emissions. Some parts of California in the USA, are leading the way by setting limits for the number of tons of NOx that a company may emit in a single year, as well as limits on emission concentrations (usually specified in mg of NOx per Nm3 of industrial exhaust), but this is the exception and not the norm. In Europe the EU member countries have stated a goal to reduce the absolute emission levels (tons per year) of NOx but the efforts to reduce NOx focus on setting limits on emission concentrations, which has little overall effect if the total number of emission points is increasing. As a result, the warning levels for NOx and Ozone are often exceeded at critical times of the year. The number of transgressions of the pollution levels in the UK has even led to the government being pursued legally for failing to meet the air quality levels required by the EU. Individual cities and regions within Europe have been forced to restrict traffic numbers during periods of high pollution levels (NOx, Ozone, Particulates), by only allowing cars with odd or even registration numbers on alternate days. Yet why are there no caps on NOx generation throughout the EU? The answer may lie in the fact that the majority of energy generation systems, and this specifically includes Cogen and Trigen systems, are based on combustion. So putting a real emission cap on NOx is effectively putting a cap on the growth of industry, which is counterproductive for the creation of jobs and local competitiveness for the regions themselves. Some regions and cities across Europe have been forced to take things into their own hands and are limiting the number of permits for the installation of new generation assets, which in effect is restricting the growth of industry within their own regions in an attempt to minimise their local NOx problems. So what does the < 1ppm technology of Ener-Core mean? What is the real effect of this capability? How does this translate into impact in the real world. 1ppm of NOx does not really mean anything until it is put into context. This begins to be understandable when we look at the amount of NOx that is avoided when the Ener-Core technology is employed rather than traditional combustion technology. ** <1ppm NOx is not a limit but achievable NOx level. To put this into even greater perspective these numbers of vehicles can be compared to the estimated number of vehicles in several major cities within Europe. 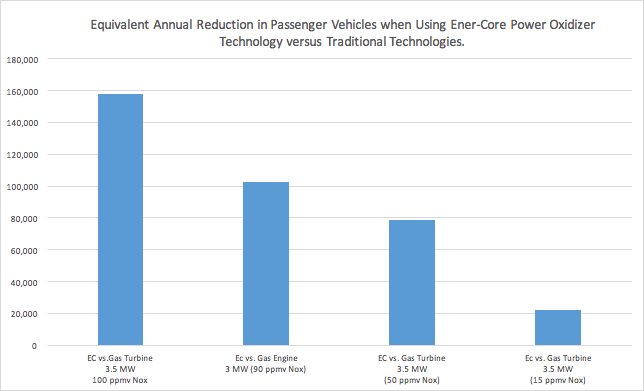 This shows that the decision to replace an existing system at the 3 – 3.5 MW size, results in the equivalent reduction of total NOx emissions of over 150,000 passenger vehicles, which is more that the total number of vehicles owned within the cities of Oxford or York in the UK, and is approximately 50% of the passenger vehicles owned by the inhabitants of Bonn in Germany. NOx has been identified as one of the key pollutants that has been linked to serious health issues and is strongly believed to be a contributing factor in a significant number of premature deaths. As such it has become a major focus of the EU and the USA environmental agencies to reduce these emissions from a perspective of cost reduction in the health sector, as well as (and more importantly) to combat the negative health effects on the population at large. As NOx emissions are largely a by-product of combustion, which until recently has been the only way that industry could generate local heat and power, governments are faced with the dilemma that capping the total levels of NOx emissions on a tons/year basis means that they are also in danger of limiting the growth potential and competitiveness of that very industry within their region. Thankfully that is no longer the case. The Gordian knot of NOx emissions has found it’s Damoclean Sword. The technology from Ener-Core allows distributed power and heat production, often with fuels that other systems could not even use, and that with near zero NOx! Assumption: Gas Turbine Exhaust: 53600 Nm3/h, Gas Engine Exhaust 13750 Nm3/h, both corrected to dry exhaust at 15% O2. Estimations based on populations of the individual cities and the average number of vehicles per person for the country in question.